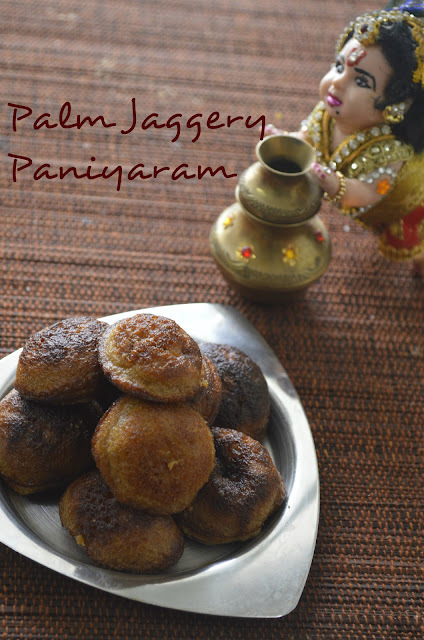 Calcium Rich Nutritious Palm Jaggery is used to make this Sweet Kuzhi Paniyaram. 1. Soak raw rice and idli rice for 8 hours maximum. Soak fenugreek seeds separately for 8 hours maximum. Soak urad dhal separately for 1 hour maximum. Soak poha for 5 minutes maximum. Drain the water and set aside. Grind urad dhal, fenugreek, poha for 15 minutes with very little water to a thick batter. Remove them to a vessel. Add the raw rice and idli rice to the grinder / mixie and grind to a thick smooth batter with very little water possible. Add the urad dhal batter to the rice batter and pulse it once. Transfer the batter to a container. Fill only half the container and allow to ferment for 5-8 hours maximum. It rises well and the batter is ready. Store the batter in the fridge until use. 2. In a mixing bowl, add the required batter. Add cooking soda and salt. Mix well and let it sit for 5 minutes. 3. Take the required amonut of karuppati and crush it using a stone. Add the broken pieces to a saucepan. 4.Add water till the immersing level of broken karupatti. Let it boil till the karupati dissolves completely. Keep stirring. Once the karuppati becomes liquid completely, turn off and allow it to cool completely. 6. Take the coconut flakes and roast in ghee using a tadka pan. Once its nicley browned, add it to the prepared karupatti batter. Mix well. 7. 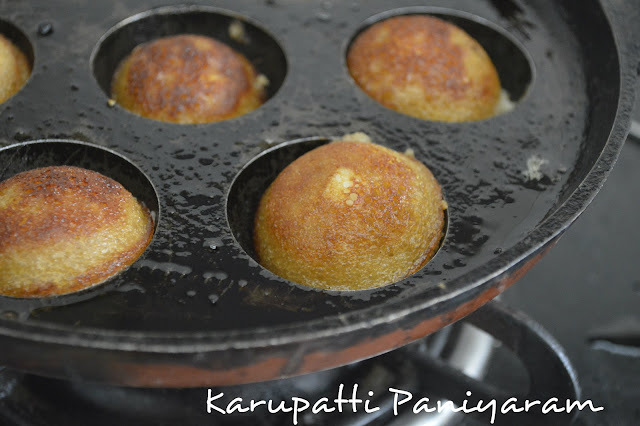 Heat paniyaram pan, add few drops of ghee in each hole. Fill each hole with 3/4th of batter and cook in low heat for few minutes. As it cooks, the batter slightly arises in the center and small holes start to appear. Now, flip the paniyaram to the other side and cook for few minutes til it turns golden and crispy outer. The batter is same as appam batter. You can make a big batch and use for each recipes separately. 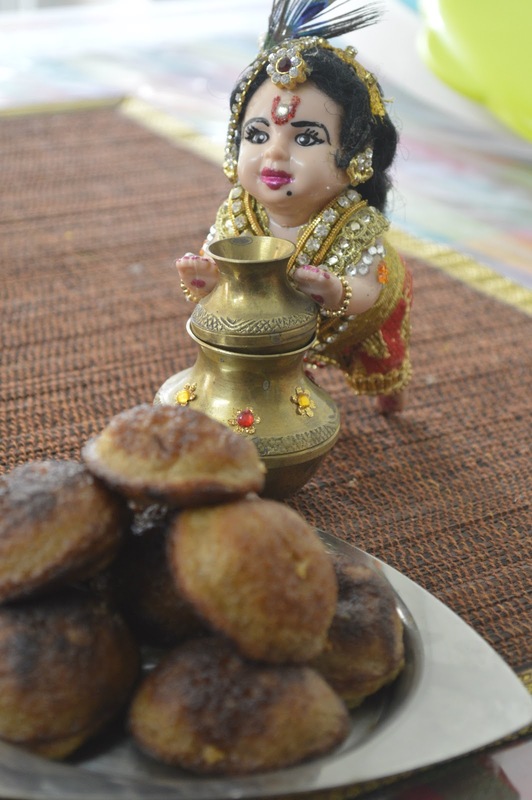 For any sweet paniyaram, the batter has to be thick as we add sweet jaggery water or karuppati water which will dilute the batter to the required consistency. The batter tastes good for long in the fridge. For sweet paniyaram, never increase the flame from low. Cook slowly in low heat. Check the consistency of batter from the picture (7). It should be slightly thick and runny like dosa batter. The karuppati syrup can be prepared using the karuppati powder readily available also. Karuppati powder can be mixed in the batter and then the consistency can be adjusted. We strain to remove any impurities present in the karupatti. If you have god quality karupatti, then you can directly add it.